Published Apr 16, 2018 by Addison-Wesley Professional. In Core Java 11 Fundamentals Complete Video Course, Second Edition, Cay S. Horstmann takes that same approach to introducing experienced programmers to Java, with detailed demonstrations and updated coverage of Java SE 11 features like Single File Launcher (if your program is contained in a single file, you don't need to compile it first). This training pairs with the forthcoming eleventh edition of Core Java, Volume I—Fundamentals, which has been fully updated to cover Java SE 11. 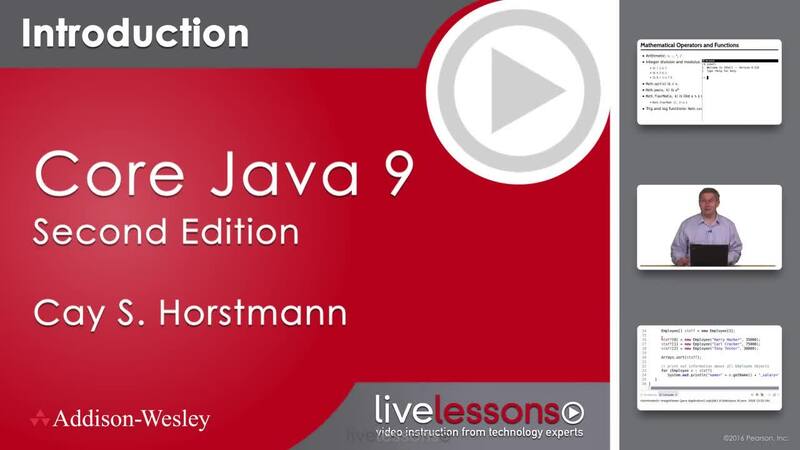 The first two lessons of Core Java 11 Fundamentals Complete Video Course, Second Edition, quickly review the history of Java and show you, step by step, how to install the software development environment. In Lesson 3, you will learn how to do in Java what you already know in another programming language: write branches and loops, and work with numbers, strings, and arrays. Cay S. Horstmann is a professor of computer science at San Jose State University and a Java Champion. He is also the author of Core Java®, Volumes I and II, Tenth Edition (Prentice Hall, 2016), Core Java SE 9 for the Impatient, Second Edition (Addison-Wesley, 2018), and Scala for the Impatient, Second Edition (Addison-Wesley, 2017). He has written more than a dozen other books for professional programmers and computer science students.